The movie also marks the reteaming of SRK & Kajol - arguably the most successful pairing of actors from modern day Bollywood. The story revolves around Rizwan's move from India to the United States and how he met and subsequently fell in love with Mandira (Kajol). The love story angle is standard fare for an Indian movie but with a twist this time around as Rizwan is not your standard golden boy movie hero and Mandira is a Hindu with a teenage boy. Their lives (and those around them) are forever changed and scarred by the events of 9/11 and the movie takes a real look at how many Indians & Pakistanis were treated in the days/weeks/months after and continue to deal with the ramifications of to this day. The movie also looks into how ordinary people (both Indians & Americans) can resort to violence to deal with problems beyond their worst nightmares. It's all a little complicated and to add to the already tragedy laden plot, the story has Rizwan stop along in Georgia to deal with a Katrina like hurricane and help rescue a town that the federal government neglected. I lived in New Orleans when Hurricane Katrina hit and obviously the scope of the tragedy was far beyond what the movie showed and the inclusion of the hurricane into the plot was a bit unnecessary. However borrowing a page from 'Forrest Gump' it did serve to put our very Indian hero smack in the middle of his second very American tragedy. 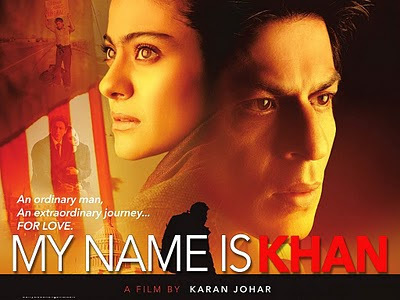 It all boils down to a very watchable and entertaining movie that fans of SRK and Kajol will most likely enjoy. The messages are somewhat heavy handed and like most Bollywood movies the film goes on for about 30 minutes too long. But like I said in my post prior to watching the movie, I was most interested in seeing if Shah Rukh Khan was going to step out of his comfort zone and actually act instead of going through the motions and he did not disappoint. Kajol does her usual Kajol thing and maybe it's her turn to step outside of her comfort zone and do a role ala Nandita Das or Tabu that stretches her abilities as an actor but that's a post for a different day. My main quibble with Kajol though? At the risk of sounding shallow I will say that seeing her on the big screen for the first time in years had me gasp a bit because of well... the sheer bushiness of her eyebrows. I know one is supposed to look past all that and she has gone on record to say that she refuses to wax or thread them to preserve a more 'natural look'. Well if you are going to do that then why shave your legs or wear make up? Why not just go natural for your whole look instead of just parts? Just my two cents but judging from what many people have said I am certainly not in the minority in my views on 'Eyebrowgate'. The title song of the movie Tere Naina (sung by Shafqat Amanan Ali) is one of my favorite songs of the year and today's addition to the jukebox. Ali is a classically trained artist and founded the highly successful Pakistani band Fuzon. He left the band after being featured more and more in Bollywood movie productions and also sung the title song (Yeh Honsla) to one of my favorite Bollywood movies, 'Dor'. While the movie grossed the highest opening weekend and opening day overseas for a Bollywood film, only time will tell if the film is as fondly remembered as SRK's other hits. It's definitely worth a watch and very much more than just a 'time pass'. It's nice to read a review in the Bolly-blogging community that doesn't rip this movie to shreds. I saw it for the 2nd time yesterday and was reserving my review until the movie could sink in. Plus I wanted to see if the 2nd time my opinion changed. It didn't. I still really loved it for lots of the reasons you mention (especially Shah Rukh's amazing performance)and a few others. Thanks for making me feel like I'm not alone! Shell - I try not to read other reviews of movies I know I am about to do for fear of tainting my own write up. I went over to Beth's blog and was surprised to see the beating this movie was getting by everyone. And like you, I really don't get it. I would recommend this movie to people and have certainly seen much worse. I posted a long comment on Beth's blog as well that you can read there but the gist of it was that I 'grade' Bollywood films (with the exception of art house movies) and Hollywood films on very different scales. Bollywood gets graded much more softly mainly because the movies are so much more about escapism (at least for me) than Hollywood movies are. I really just want to be entertained and it's ok if it's critically not up to par. If you don't bore me and keep the pace going for three hours - well, I can't really ask for much more. And as to all the folks that are upset about the stereotypical black family that was portrayed in the movie - I agree with them a little bit. But when Kumar from 'Harold & Kumar go to White Castle' is the most realistic representation of most Indian people I know... it appears that everyone has a ways to go to provide more accurate representations of minorities in film. It should be there this weekend, and I'm there! I agree with the comments above, it isn't the best but neither is it anywhere close to the worst! As you can see in my review, I also don't think the hurricane scene was necessary. Aww, I love Kajol's unibrow! Not because it's natural (because, as you say, that's inconsistent), but because it's so uniquely and distinctively her. Once I see those bushy brows, I know it's her. And I can't imagine her face without them. I also think they compliment her gorgeous eyes beautifully and add to her unconventional beauty, but hey, it's all down to personal taste. About the movie, I LOVED SRK's performance. I thought it was beautiful and made Rizwan an utterly unforgettable character. I thoroughly loved the first half of the film but thought the script lost its way a little in the second half, and let down the film a bit. Overall though, I loved the movie and will definitely be rewatching it in the future. I think it has absolutely gorgeous music as well. Finally, it's great to see you blogging a little more frequently these days - you were missed! Trust Nilu and Rajan are doing great! MsBlogger - yep, I agree with both of your statements. This movie falls somewhere in between 'best movie ever' and 'time pass'. I still don't get all the bashing it's continuing to receive in the blogosphere but to each his own. DG - everyone is doing great and thanks for your warm wishes! Regarding Kajol's katerpillar above her eyes ;) - I understand what you are saying about the fact that they are unique to her. But to me they were never like Lauren Hutton's gap between her front teeth or Madhubala's crooked smile. Those were additions to their beauty and I feel Kajol's distracts from those gorgeous eyes of hers. It's like trimming the edges of a lawn to appreciate the beauty of the garden. And yes, SRK knocked it out of the park with his performance even though (like most Bollywood movies) the script ran out of gas in the second half. Glad you liked it as well though. Thanks, Sanket! Okay, I've seen MNIK now, and although it'll be a few weeks before I get to writing about it, I completely agree with all you've said. Are you kidding? Her eyebrows are the whole reason she's so hot. David - I guess this is where we have to agree to disagree. But hailing from the country that invented eyebrow threading you would think she would succumb to it's allure to actually maker even hotter! No, I can NEVER agree with you about Kajol's gorgeous eyebrows. "katerpillar"!!! And with a capital K??? Sorry, but you ARE "sounding shallow". I say this with regret because you obviously know that this isn't an issue, and you raise it all the same. Oh, and: it seems that you don't know what REAL bushy eyebrows are! Yves - it's a matter of personal taste and if you like her eyebrows then that's lovely. It's just distracting for me, nothing else. Her mother (Tanuja) was lovely and she (along with every other Indian/Pakistani girl I know) got her eyebrows threaded. Every Indian/Pakistani girl I know is horrified by her eyebrows and to be honest I didn't even notice them that much until they began complaining about them to me years ago. For the record, I love Kajol and just think she would look better with her eyebrows a little more under control. If she was truly into the natural look then why does she wear make up or wax her arms or shave her legs? It's her choice and more power to her for marching to the beat of her own drummer. But if SRK had a mole on the side of his face that had a big hair growing out of it and refused to clip it or pull it out - would that be OK? It is completely natural (just like Kajol's eyebrows) but in my opinion it would be distracting. In America, girls shave under their arms and it is the norm - something that in alot of European countries is not done. And in India/Pakistan - not only do women shave under their arms, they wax their arm hair, leg hair, upper lip hair and yes - eyebrows as well. And yes, I have seen much bushier eyebrows than Kajol's ;) Everyone's ideas about beauty are different and at least we can both agree that Kajol is a great actress and that we love her movies. Cheers! You're right, we agree on the essential! But I think personally that elements in one's face are different from other aspects of the body: I don't know if it is because Kajol wants to look "natural" that she doesn't trim her evebrows, but if she doesn't do it, I think it's unfair to say it's the same as if she didn't shave under her arms or elsewhere. Hair there does not participate to the expression of one's personality. So if she chooses to keep (what you call) bushy eyebrows, it's probably because they belong to her personality. Anyway, all this is very far from cinema and acting!! Shafqat Amanat Ali is one of my favorite singers. I wish he would sing more songs with great music directors.